Black Rock Mountain State Park is open again after being closed all winter. I found this trillium on the Spring House Trail. Last year Rabun County had several tornados that took out trees all over as it crossed diagonally across the county southeast to northwest. Along the Spring House Trail several trees were blown over in the botanically sensitive wild flower section. There are signs asking people to stay on the trail. When removing the trees it seems someone did not heed the message. There are track hoe tracks right over some of the most sensitive trillium areas. Fortunately, the trillium did not seem to be hurt by this and are quite abundant in the same tracks put there by the hoe. This trillium is a Little Sweet Betsy Trillium Tillium cuneatum. 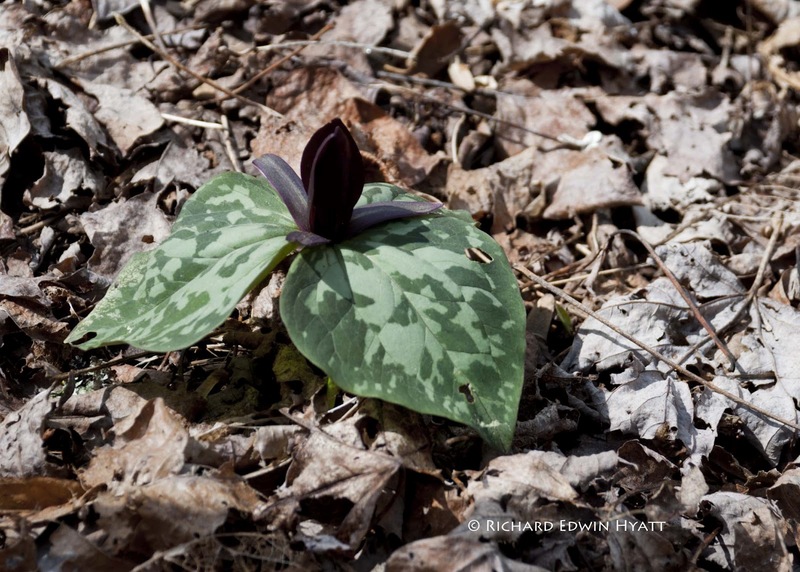 It is a mottled trillium that has an erect stem and blooms just above the whirl of leaves.